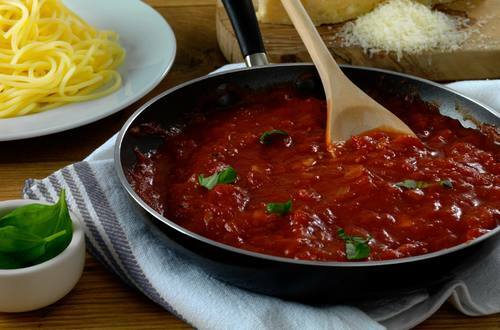 This classic spaghetti sauce combines sweet tomatoes with rich Hellmann's® or Best Foods® Real Mayonnaise and infused flavors of thyme, oregano, allspice and bay leaf. 1 Heat olive oil in large nonstick skillet over medium heat and cook onion, stirring occasionally, until almost tender, about 3 minutes. Add garlic and cook 2 minutes. Stir in tomato paste, sugar, oregano, thyme, allspice and bay leaf. Cook, stirring occasionally, 3 minutes. 2 Add wine and bring to a boil over high heat. Reduce heat to medium and cook until wine is almost evaporated, about 5 minutes. Add tomatoes and water and bring to a boil, stirring occasionally. Reduce heat to low and simmer, stirring occasionally, until sauce is thickened, about 15 minutes. Stir in basil. Cool slightly, then stir in Hellmann's® or Best Foods® Real Mayonnaise. Remove bay leaf. Makes enough sauce for 1 lb. spaghetti or your favorite pasta. *Substitution:  Use 1 tsp. dried oregano leaves, crushed. **Substitution:  Use 1/4 tsp. dried thyme leaves, crushed.